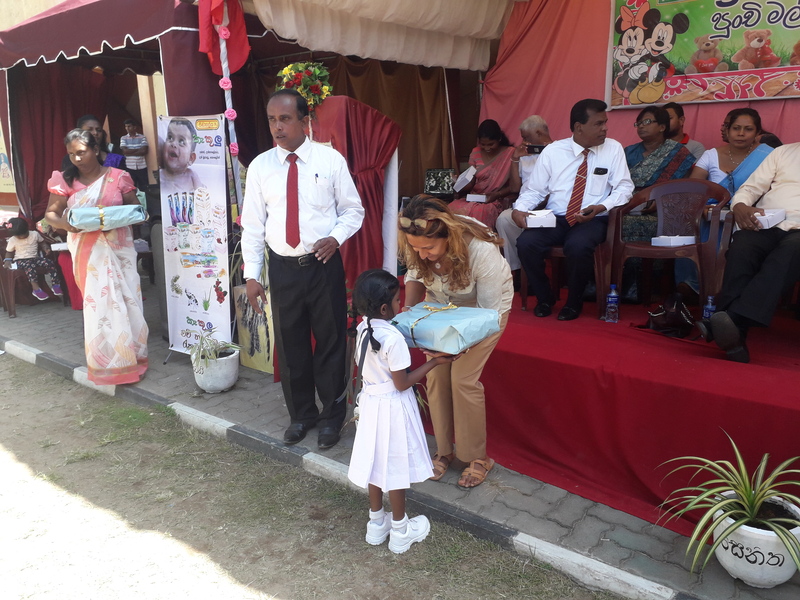 Year one students who entered the 140 year old Sri Dharmarama Vidyalaya, Ratmalana, one of the oldest schools in Sri Lanka – received new school bags with the compliments of the Hettigoda Group. As patrons of the school in their neighbourhood, the country’s leading ayurveda pharmaceutical manufacturer was part of a group of establishments who provided the year one school children with all the school requirements for their initial year in school. About 60 new schoolchildren were present at a ceremony at their school premises last week to receive this complete package which included everything a young school beginner needed in school. The school was established by the Venerable Dharmaloka Thero in 1879, in Ratmalana and known as Sri Dharmaloka Vidyala. The school which had only English medium classes catered to the Buddhist students of the area and was in close proximity to St. Thomas’ College, Mount Lavinia set up by the British missionaries in 1876, to cater to the Christian students. While Sri Dharmaloka Vidyalaya was a leading Buddhist school at that time it changed name to Sri Dharmarama Vidyalaya in 1910 under the stewardship of the Venerable Dharmarama Thero. The school had both English and Sihala medium classes during this time. Sri Dharmarama Vidyalaya had experienced gradual deterioration and decline in popularity as a leading school in the city in the past decade. The school which had classes up to the Advanced Level grades in the past is now a primary school with classes only up to grade five. The school which once accommodated more than 1500 students had dwindled to a cadre of less than 100 in recent times. It is under the tenure of the present principal of the school, Mr. P.K. Marambage that with the support of the Old Students Association that the school is being resurrected to its past status as a leading education institution in the city of Ratmalana. In his address to invitees and parents at the ceremony, Principal Marambage said that his plan was to gradually introduce the higher grades to the school right up to the Advanced Level classes. His vision was to resurrect and elevate the school back to its past stature with facilities and academic results on par with the leading schools in Colombo. The Hettigoda Group has been working consistently on several projects to promote children’s talent and educate them on the importance of preserving our environment. Among the national level programs undertaken by the Hettigoda Group for children is the popular Kekulu Art Competition where preschool children are provided a platform to express their natural talents through this All Island Art Competition. The Herbal Garden Project is another project aimed at educating our younger generation on the necessity of protecting our environment and the value of our indigenous herbs in the ayurveda medical industry. Children’s welfare and education is a priority in the company’s Corporate Social Responsibility initiatives and the company also manufactures a series of herbal dental care for children and baby care products. Siddhalepa also led a project to assist a Tsunami affected school in the south to relocate and rebuild. With assistance from tourism partners, Annula Devi Balika Vidyalaya, Magalle, Galle was relocated in Walahanduwa, Galle and renamed Janadhipathi Balika Vidyalaya at a total project cost of Rs. 110 million.